What’s the difference between the different metrics? There are a variety of reports inside your Customer Thermometer account. Your reporting dashboard is the first screen you see when you login to your account. For more detailed reports and analysis, visit your Reporting area. 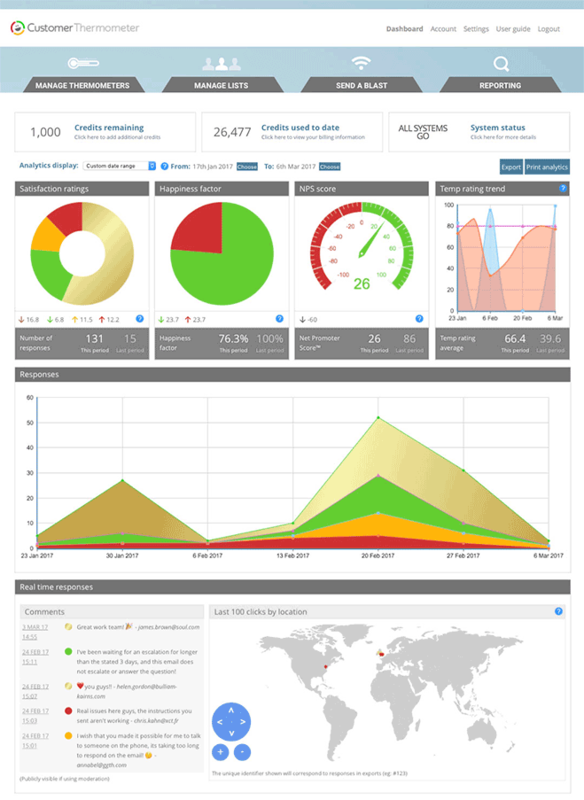 Below is an example of your Reporting Dashboard. It displays all responses from all Thermometers inside your account, by date range. Temperature rating provides a single number per Blast to benchmark trends. The Blue line is the current period. Happiness factor is the %age happy vs %age disappointed responses. NPS score, when enabled, provides your Net Promoter Scores. Click here to see how we calculate the variance from the previous period. Comments displayed on this dashboard show publicly IF you are using moderation. The rest of your reports and analysis can be found in your Reporting area. Note the different tabs available for selection in the sub menu..
To find out more about each report, visit the Reporting area help page.